This year we will hold our 11th annual KIDS event. If you have a child, another family member, or friend, with Down syndrome, or simply want to show your support, and you are attending the March for Life in D.C. on January 18, I invite you to join us at our KIDS event at the National Right to Life headquarters in D.C, from 10:30 a.m. to noon. As the mother of a daughter born with Down syndrome, I was greatly affected by a recent story in National Right to Life News that ran under the headline, “German man who survived late-term abortion in 1997 passes away.” Tom, the 21-year-old adopted son of Bernhard and Simone Guido, had died suddenly after suffering from a lung infection. In 1997 at 20 weeks gestation his biological mother learned that Tom had Down syndrome. Tom survived an abortion attempt. However he did not receive medical attention for the first nine hours outside the womb, resulting in considerable health problems. Happily, the Guidos adopted him, and Tom was well loved for the remainder of his life. The injustices abound. The attempt on his life, the health problems he endured, as a result of his forced premature birth (that wasn’t supposed to be born alive), all because he had Down syndrome, is just too much to bear. It is simply unconscionable that this prenatal discrimination is all perfectly legal, and occurring in many countries all over the world, including the United States. Tom’s story reminds me of why I became involved in the pro-life cause. Just a year after this young man was born, my own daughter, Sadie, was born with Down syndrome. She has been nothing but a joy. She is beautiful, bright, kind, and thinks very deeply about things. Just by being herself, she has shown me how wrong the inaccurate and negative preconceptions I once held about Down syndrome were. Shortly after she was born, I learned the high rate of abortion of babies with Down syndrome (estimated to be about 70% in the U.S.). I knew I couldn’t just stand by the sidelines any longer. A little over 10 years ago, Leticia Velasquez and I thought there should be a group, made up of families who have children with Down syndrome, walking together in the March for Life, representing the vulnerable unborn babies with Down syndrome. We co-founded KIDS and held our first event prior to the 2009 March for Life. 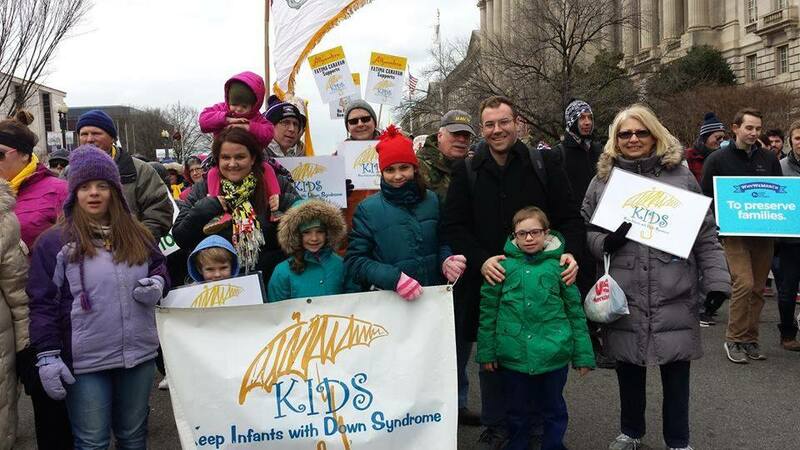 It is a powerful witness to see a large group of families and friends who love someone with Down syndrome, walking together in the March for Life, with the message, “Keep Infants with Down Syndrome” on our signs! Won’t you join us? For more information, or to let me know you would like to attend, please e-mail me at vteileen@comcast.net. Eileen Haupt is a co-founder of Keep Infants with Down Syndrome (KIDS). She is board member of Vermont Right to Life, and is an alternate delegate to the board of the National Right to Life Committee.